Prominent Valley grower and water-management consultant Sarah Woolf has resigned from the board of directors at Westlands Water District. In a letter sent to the district, Woolf cited differences with the board majority on how best to increase water supplies for district growers as a primary reason for her resignation. In an interview Thursday, Woolf added that she disagreed strongly with the leadership of longtime Westlands General Manager Tom Birmingham. She said that Birmingham’s focus on “litigation and legislation” was failing water-starved district growers. Asked for specifics on ways that Westlands could improve its water situation, Woolf said that the district needed to team up with other water districts and embrace groundwater recharge. “Everyone in the San Joaquin Valley is in a water crisis,” Woolf said. “We all know our water supply is in jeopardy. We all need to work together. But (at Westlands) we can’t get past our borders. We just talk about what we’re doing inside our borders. 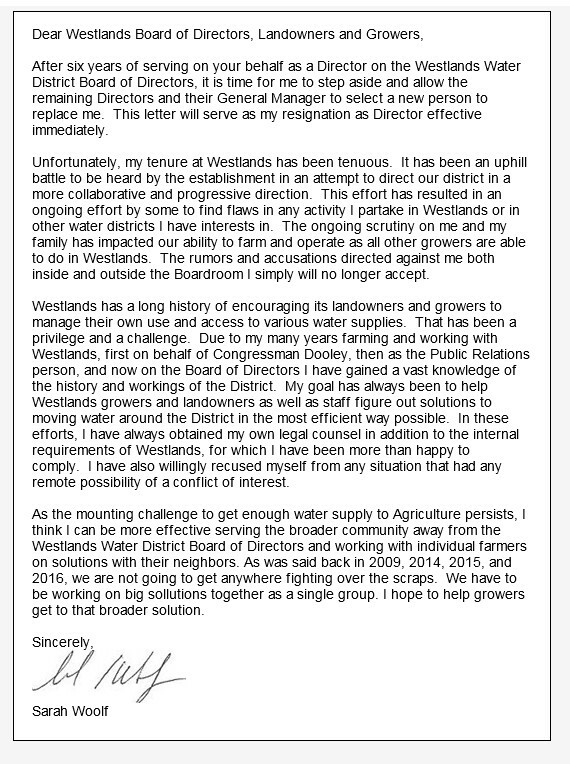 In her resignation letter, Woolf said that the differences of opinion about Westlands’ operations had negatively affected her family’s farming operations. Woolf served on the board for six years, and her term expires in 2021. The district has 60 days to appoint her replacement. Woolf is president of Water Wise, a water management company for Valley growers. She also is a partner in Clark Bros., which is involved in farming, construction, and other industries. In addition, she and her husband, Chris, participate in farming more than 30,000 acres in the Valley and other parts of California. In February of this year, the Los Angeles Times reported that Woolf briefed Sonny Perdue, the U.S. Secretary of Agriculture, on the complicated maze of laws and agencies governing water in California. Westlands, a public agency, encompasses about 600,000 acres in Fresno and Kings counties is the largest ag water district in the United States. Its headquarters are in Fresno. Thomas W. Birmingham, and Louie David Ciapponi (collectively “Respondents”). Why is Birmingham still on the Board? Mr. Birmingham is the general manager of Westlands, not a board member.